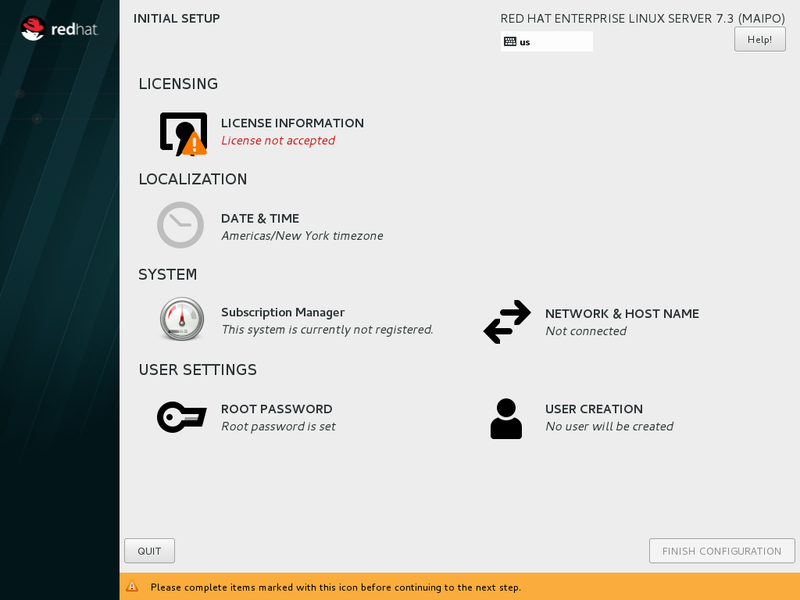 Using the Server with GUI base environment in the Red Hat Enterprise Linux setup. [a] This option is only displayed if you did not previously agreed to the license. [b] This option is only displayed if you did not previously set it. The --reconfig option specifies that all options should be displayed. For further details about Kickstart installations, see Chapter 26, Kickstart Installations. 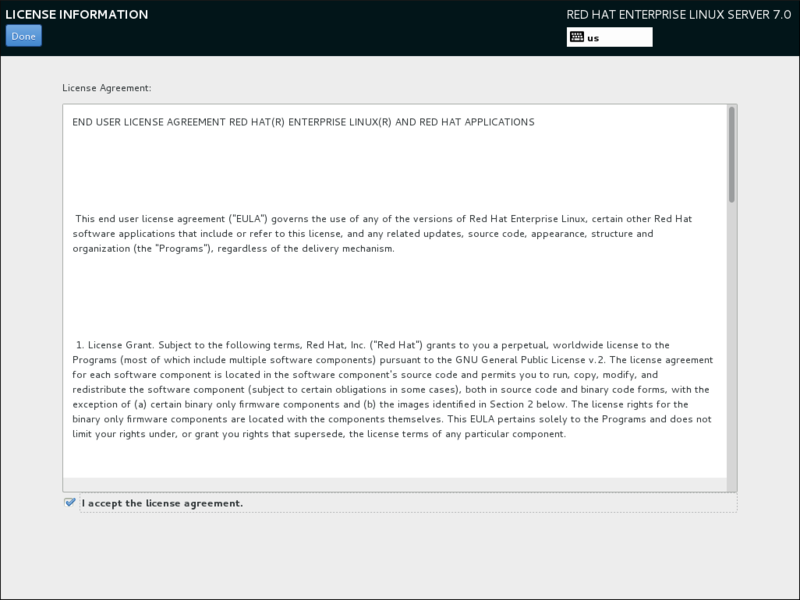 The License Agreement screen displays the overall licensing terms for Red Hat Enterprise Linux. In order to continue with the configuration process, the license agreement must be accepted. Exiting Initial Setup without completing this step will cause the system to restart, and once the system finishes rebooting, you will be prompted to accept the agreement again. Review the license agreement. Then, select I accept the license agreement. and click Done to continue. The User Creation screen is the same as the one used when creating an account during the installation. See Section 8.18.2, “Create a User Account” for detailed information. Similarly, the Network & Host Name screen is the same as the one used when setting up network. See Section 8.12, “Network & Hostname” for information. 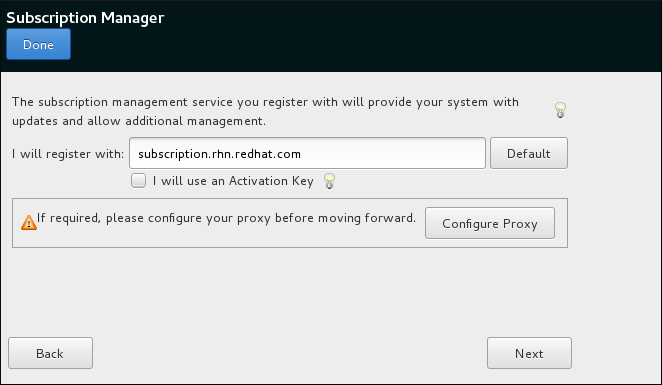 The Subscription Manager screen allows you to register your system with Red Hat to receive updates and install additional packages from repositories provided by Red Hat. For information about how to register your system, see Section 30.1.1, “Subscription Manager”. Once ready, click the FINISH CONFIGURATION button to register your system, before completing the Initial Setup configuration process. The Subscription Manager screen allows you to register your system with Red Hat in order to receive updates and access to package repositories. The Subscription Manager screen in Initial Setup replaces the Firstboot tool, which was used to register systems in Red Hat Enterprise Linux 7.1 and earlier. The Subscription Manager screen provides a basic interface which is suitable for most use cases. In some scenarios, you require options which are not present in Initial Setup; in that case, you can skip the post-installation registration process and use Subscription Manager from the command line or using the subscription-manager-gui package which provides a graphical interface. Also note that some registration scenarios, such as registering using CloudForms System Engine, require additional setup steps - you must have a registration server ready before registering your system. To register your system, follow on-screen instructions, providing your credentials when prompted. Note that if you want to leave the Subscription Manager screen and return to the main Initial Setup screen, you must use the Done button in the top left corner of the screen, not the Back or Next buttons in the main window. For full documentation concerning various tools for system registration and management, see the Red Hat Subscription Management section of the Red Hat Customer Portal. Additionally, you can use the Registration Assistant for an interactive guide through the registration process.